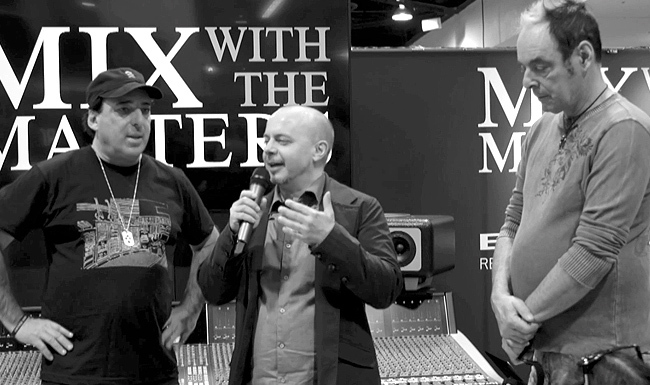 Chris Lord-Alge: The people who make these speakers are working on it right over here. I want to have Thomas Barefoot wander up here if that’s possible. Thomas, come on up here. This is the designer of the speakers you’re hearing. This is his monster stack. These are his MM26’s, and now he has the Footprint which is the really approachable small speaker for everyone to put next to their rigs. Thomas, Tommy and I are really big fans of your speakers just recently. We’ve been diehards with Yamaha’s and a couple other speakers. It seems like it’s literally snowballed, the sound that you got from your speakers. Tell us a little bit about the excitement you’re having from all the music makers that have got behind your MM27’s. Thomas Barefoot: Okay. It’s been absolutely amazing, guys like these. I think with a Footprint now … The way it’s always been, we’ve been at trade shows. People coming up to me and saying like, “Oh, one of these days, you know, I’m going to be able to buy a Barefoot.” Here at NAMM this year, we’ve actually got people coming up to say, “Oh, I think I can actually do this now.” That makes me really happy. Chris Lord-Alge: That’s great, Thomas. The thing that we love is that you’re becoming approachable to our artists. You’re making it so the musician, the producer, the engineer is actually has something they can be approachable with your company. You’re creating a product that, A, it’s in their price range. Once they start there, they can move up, up the ladder to your larger items. The quality of what they’ve come up with is really exciting because our world is changed, and it’s gone to be able to hear more bottom, more clarity in the top and mid range. That’s what you get with Barefoot. They’re some of the best speakers around. They’re really popular. We’re really happy to be on board with you, me and Tom. Thomas Barefoot here today. Thank you for coming up, Thomas.